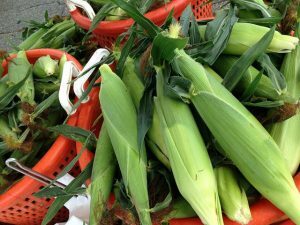 Take your four ears of fresh corn and cook them in a pot of boiling water for about 10 minutes or until they are tender. After letting them completely cool, cut the kernels closely from the cob. Add the kernels to a bowl and add in the chopped cherry tomatoes, white onion, and basil. Then mix the olive oil and the lime juice and add it to the bowl of veggies. Give it a stir and enjoy! This recipe is also great for improvising and using what you have on hand. Possible variations include using red onions/shallots, mint, feta, watermelon etc. 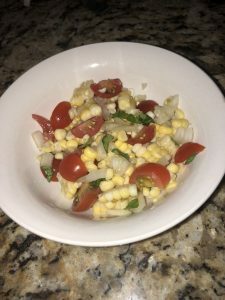 I loved the summer corn salad because it made it so easy to enjoy farm fresh veggies all at once. The white onion I used in this recipe was from Wake Robin farm, also found at the Dover market. The basil was my own from my herb garden but I usually love to get it from Bumbleroot Organic farm that is often selling at the Saco, ME Farmers market. The cherry tomatoes were from Mckenzies farm which is at the Dover market. This salad was delicious and I think a fun alternative way to use the corn, especially a less messy way than eating it off the cob. I hope you give this recipe a try when you get corn this season!